This promotion was earned and reflects the quality of work she has provided our firm and clients. The Illinois law firm Salvi Schostok & Pritchard P.C. is pleased to announce Carly E. Shannon has been promoted to Associate Attorney after working at the firm as a law clerk since 2016. Ms. Shannon concentrates her legal practice on cases involving medical malpractice, personal injury and products liability. Ms. Shannon received her law degree from DePaul University College of Law. While in law school, Ms. Shannon worked as a teaching assistant for a first-year legal writing course. She also received two CALI awards (given to the student with the highest grade), and was on the Dean’s List. Prior to working as a law clerk at Salvi, Schostok & Pritchard, Ms. Shannon worked for the corporate counsel of the world’s largest futures and options exchange, where she drafted non-disclosure agreements and various regulatory filings. 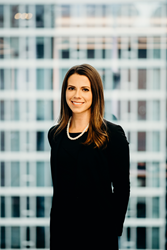 In August of 2017, while serving as a law clerk at Salvi, Schostok & Pritchard, Ms. Shannon assisted a trial team that secured a record-breaking $148 million jury verdict on behalf of a woman who was paralyzed at O’Hare International Airport. Ms. Shannon received her Bachelor’s degree in Political Science from Clemson University and is a native of Lake Forest, Ill.
Carly E. Shannon can be contacted at (312) 372-1227 or cshannon(at)salvilaw(dot)com.